Can you walk us through the evolution of the sales enablement function? What did it look like five years ago? What’s the state of sales enablement today? Where do you see sales enablement one year from now? What are some key, top-of-mind issues that sales enablement leaders are focused on? What are some issues they may not be focused on but should be? 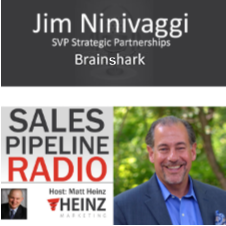 Jim Ninivaggi is senior vice president of strategic partnerships at Brainshark, Inc., a leading sales enablement solutions company. He has three decades of experience studying and driving sales productivity. Prior to Brainshark, Jim founded and led the sales enablement research practice at research and advisory firm SiriusDecisions – publishing hundreds of research briefs, reports, and blog posts during his 10 years at the firm, and helping shape and raise awareness for the sales enablement space. Brainshark, Inc. (www.brainshark.com) – a leading provider of sales enablement solutions for training, coaching and buyer engagement, helping companies close more deals faster. Brainshark Integration Engine – newly announced, this connects all the content, data and applications in organizations’ sales enablement ecosystems. Continual enhancements to Brainshark for Coaching, Brainshark’s award-winning sales coaching solution. Brainshark for Coaching empowers sales managers to coach their teams anytime, anywhere – so reps are prepared to capitalize on every sales interaction.